” Pet Shops, Puppy Farms, And Back Yard Breeders Adverts contribute towards site running costs, but currently may not fit with the site ethos. We will continue to work on a solution. How Do I know Who Is A Reputable Breeder? It is well known that puppy farms – or puppy mills as they are also called – are only interested in profit. They are not interested in animal welfare, as this would cut in to their profits. The majority of pet shops that sell puppies are supplied by puppy mills, as these unethical pet shops are also motivated solely by profit and are fully aware of how puppy mills operate. 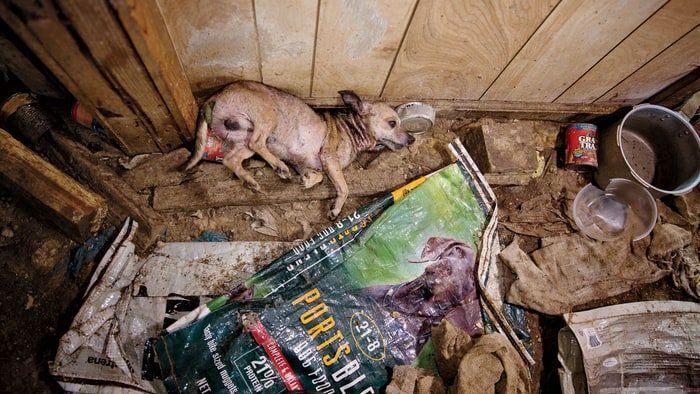 Puppy mills hold breeder dogs captive in filthy conditions and abuse them all their lives. They destroy their health by making them breed continuously from the moment they are physically able. They receive no treatment from a vet and are often starving and ill, suffering terribly. The breeding dogs die painful, prolonged deaths from infection and illness because of this abuse and neglect. Treatment from a qualified vet is considered too expensive and the dog not worth it. This is because the dog, which is simply considered a commodity like any other, can easily be replaced. No health checks are done to see if they are suitable to be breeding dogs, so terrible conditions are constantly passed down to their puppies. When the dog can no longer make money by being bred because of physical problems due to being bred too often and neglect, it is usually killed inhumanely. 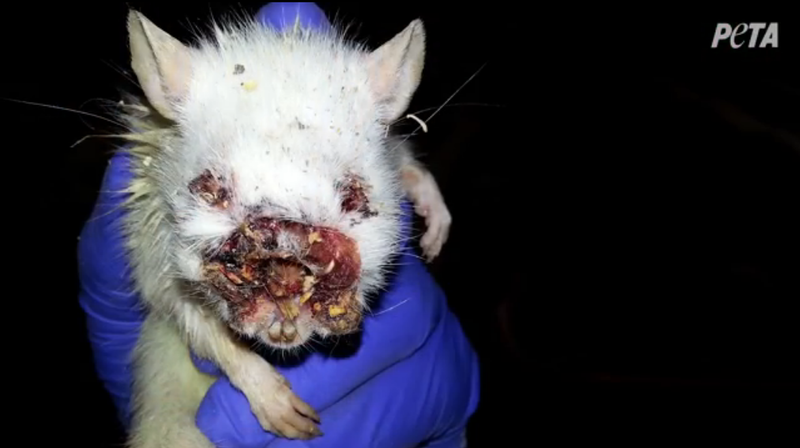 People who buy from anywhere supplied by puppy farms inadvertently fund all this suffering. Sharon and Ozzy Osbourne adopted a puppy farm breeder dog which was rescued by Many Tears Animal Rescue and shown on the TV programme ‘The Dog Whisperer’ with Cesar Milan. When she was rescued, she was a mess. At the puppy mill, she had been forced to have 6 litters in around two years. As a result, she had to undergo extensive surgery after being rescued, before being nursed back to health. Veterinary treatment is also withheld from the puppies at puppy mills because of it cutting in to profits. This means that many of the puppies also die painful, prolonged deaths. A lot of inbreeding goes on in puppy farms as the breeding dogs are not health tested. As a result, the puppies are often riddled with painful physical and behavioural problems throughout life. These problems are very distressing, painful and expensive to correct, if they can be corrected at all. Sadly, Sometimes the only humane option for owners is to put the dog to sleep. 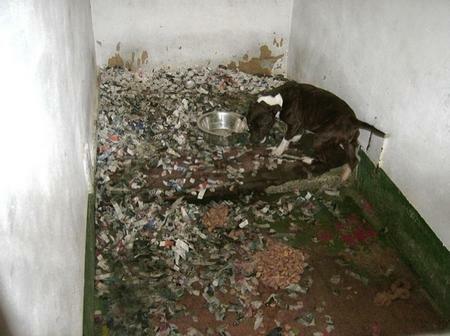 The puppy farms and the sellers they supply know about all these problems, but do not care. When each dog is taken in to the care of a US rescue from a puppy mill, it often needs between $700 and $1000 worth of veterinary treatment. The puppies are taken too young from their mothers, leaving them weak and vulnerable to illness. They then have to be transported from the puppy farms many miles to the destinations of the retailers. Many die on the journey and further puppies die in the back of pet stores and with other sellers. 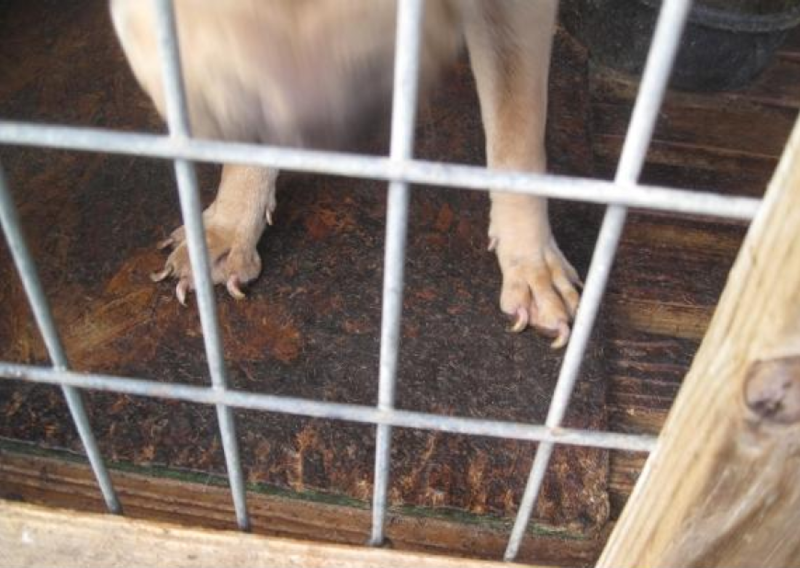 Many puppies at puppy mills are born deformed. These are usually killed inhumanely and callously when they are babies, because they are seen as nothing more than defective goods. The number of deformed puppies being born is particularly high in Japan, although it is a regular occurrence everywhere due to irresponsible breeding. Breeding needs to be done very carefully. Unfortunately, puppy farms and back yard breeders breed carelessly and a lot of inbreeding occurs. The main victims are the badly bred dogs who are born deformed and then killed or left to suffer to death, dogs who suffer physical and behavioural problems their whole lives, and of course the abandoned shelter dogs that are put to death because people fund the cruel puppy farm and back yard breeder industries instead of adopting dogs. Pet shops that sell puppies don’t want the public to know they are unethical, so will rarely admit that their puppies are from puppy mills. The act of selling puppies from cruel puppy mills – especially while millions of innocent shelter dogs are being put to death every year due to there not being enough homes – shows how unethical these pet shops are. People who purchase these puppies may think they are ‘saving’ them, but they are actually funding this cruel industry, encouraging it and enabling it to continue. Around four million puppy mill puppies are bought each year, encouraging this cruel industry to breed more. If four million dogs had been adopted INSTEAD of bought from pet shops, the puppy mill industry would see there was no demand for them and cease to exist. There would also be a whole lot fewer innocent, re-homable dogs being put through the terror of being put to death due to there not being enough homes. In pet shops, what happens to the animals that are not sold while they are still young enough to appeal to buyers? In many pet shops they are sadly killed and disposed of, or abandoned. Pet shops have been known to cause enormous amounts of animal suffering to the pets they sell, all unseen by the public. 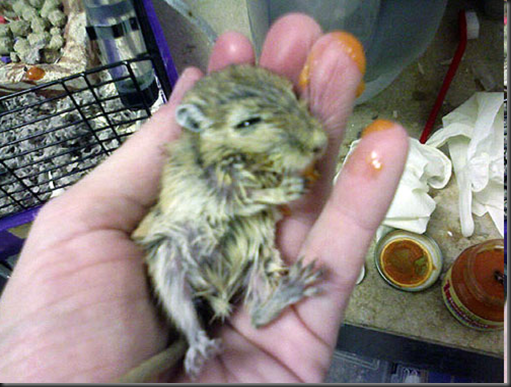 For example, Peta exposed immense cruelty At the PetSmart store in Manchester, Connecticut. An undercover investigation documented more than 100 animals—including hamsters, domestic rats, lizards, chinchillas, and birds—who lay hopelessly, just waiting to die, in the store’s “sick room,” deprived of desperately needed veterinary care and wasting away out of customers’ sight. Images: Just two of the animals found suffering out of sight of customers at PetSmart, with no veterinary treatment given. This was just one store, and a store that boasted of having an “exceptional pet care record,”. The numbers of animals suffering at pet shops everywhere are so large they are incomprehensible. Sadly, these animals suffering so much because of pet shops is not the exception, it is the rule. 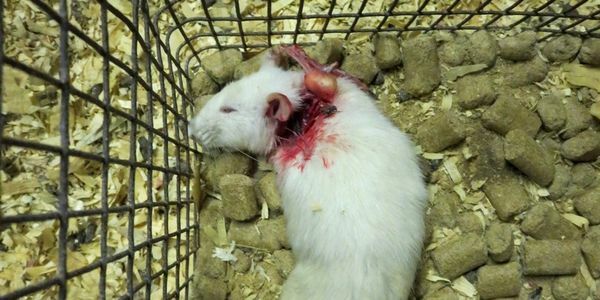 There is also cruelty involved in the supply chain, with the breeders and the suppliers of the pet stores. 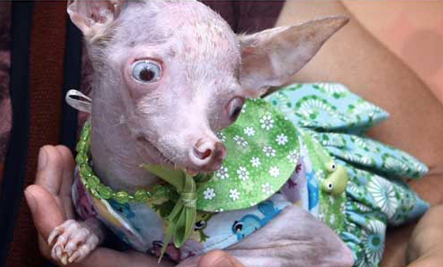 There is a problem with inbreeding, so many animals do not turn out perfect enough for pet shops to accept them. They are also rejected if they are unwell. They are then left to die without any veterinary care, or killed by drowning, asphyxiation, beating on a hard surface, freezing to death, gassed, or other methods. At PetCo, (a supplier to PetSmart), an undercover investigator from Peta found that the workers did not even check to see if the animals were dead after being gassed, and just threw them into bins for those still alive to be crushed or suffocated to death by the bodies of the others. Workers had piled dozens of animals—ranging from rats and gerbils to guinea pigs and even a rabbit—at a time into a faeces-smeared cooler and crudely gassed them with carbon dioxide. Their screams could be heard across the room. PetCo were also found to have frozen animals to death. Live rats were stuffed into plastic zipper bags or tossed onto plastic lids and put in a freezer, slowly freezing to death even as some frantically tried to claw their way out. Many of these animals were later sold as food for snakes and other carnivorous reptiles. The animals had been shipped overseas already to reach the warehouse, and some had died en route. Cats were allowed to roam throughout the warehouse, jumping into the open boxes and killing the rodents. Some were left to die in agony after being attacked. No effort was made to protect or help them. Water was not provided for hundreds of animals, and filthy contaminated water was given to others. Animals had only tiny spaces, about six square inches each. Many showed signs of stress an illness. Sick and emaciated animals languished for days, left to die. To learn of the full horror, see Peta’s article, here. Peta has exposed at least four other large scale pet shop suppliers who caused similarly cruel suffering to innocent animals. Tragically, there are countless instances of pet shops and their suppliers causing horrifying cruelty to animals, such as another one, here. You just need to look to the internet to find such cases of suffering are sadly abundant. What I have written here is only the tip of the iceberg, and is not even the worst of the cruelty. To help stop this cruelty and suffering happening you can refuse to shop at pet shops and stores that sell animals and support the stores who do not. You may think “this wouldn’t be allowed to happen with the pet store I go to”. In reality, it happens behind the scenes and in the supply chain of every pet store. There is no way that even the most seemingly ethical pet store could be 100% sure that there was no animal suffering in the supply chain of its pets. A truly ethical store simply would not sell live animals. 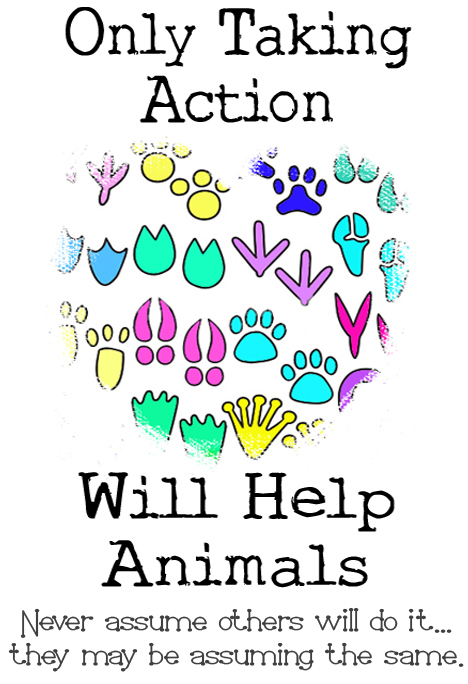 Most pet stores who sell animals do not make profit on the animals themselves, but use them to bring in the customers, who will then need to buy accessories and supplies for the pets. Only buy pet supplies from pet shops that do not sell any live pets if you want to stop the suffering. 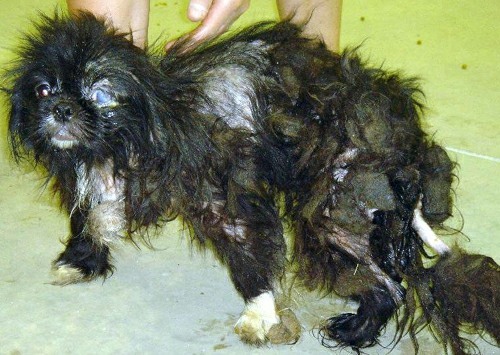 Puppy mills do not just supply pet shops. Other unethical sellers can buy the puppies cheaply from puppy mills and sell them for a huge profit to customers. They are sold online, advertised in newspapers, magazines, pet shops, shop windows and notice boards, etc. These sellers may claim to be private breeders, because nobody wants to admit to selling puppies that come from puppy farms. This is because they know puppy farms are cruel, that the practice is unethical, and they know they are ripping people off. They also know they are saddling owners with a dog that is likely to have a lot of expensive and heart breaking medical problems. 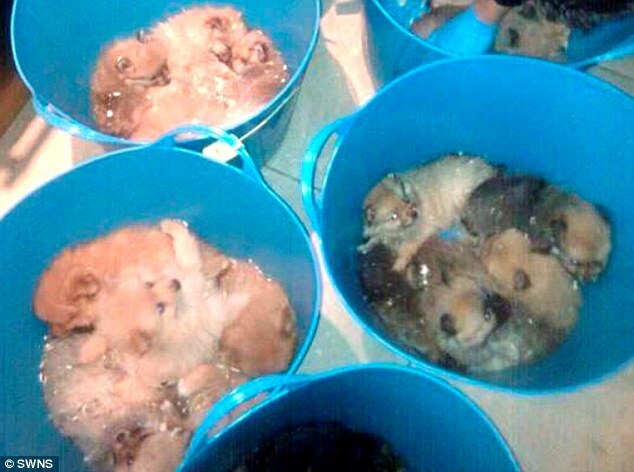 Image: 80 puppies were found by the RSPCA, stuffed in to plastic buckets at a puppy farm run from a Manchester home in the UK. A man banned from keeping animals was arrested along with a woman. 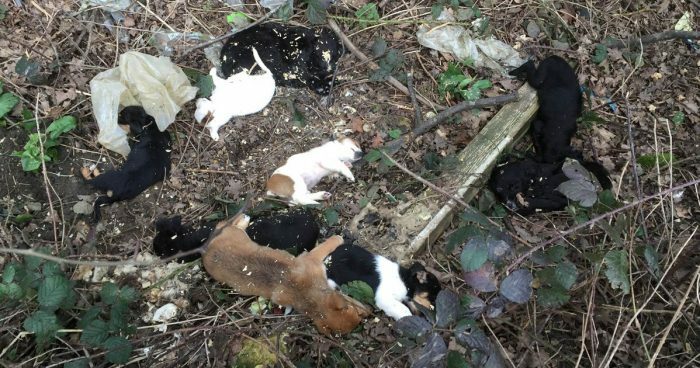 Two puppies were found dead and about to be disposed of, and four more were very ill.
Back yard breeders are irresponsible people who think breeding dogs is a way to make money. They are unscrupulous people who do not do vital thorough health checks on the breeding parent dogs, or look in to their family history health. This results in defective genes being passed down and the puppies suffering a variety of painful and debilitating conditions throughout their lives. Apart from being distressing and very often painful for the dogs, these conditions are very expensive for owners to treat. If the puppies are so deformed or sick that they are unsaleable, many inhumane methods of killing them may be used. 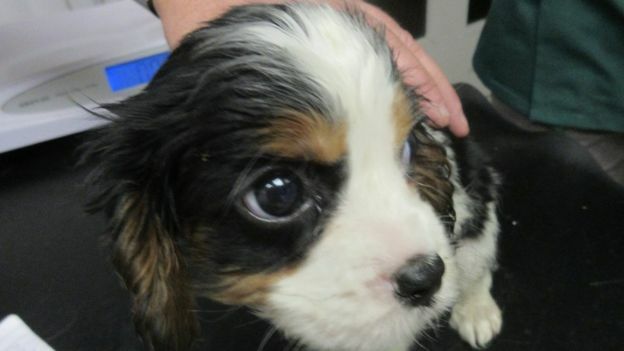 Video: The RSPCA find puppies buried alive in the garden of a back yard breeder in the UK. These breeders will advertise their puppies on websites, on social media on pet shop noticeboards, in newspapers, magazines, and other places. They need to do this because they are disreputable and irresponsible and did not make sure they had homes secured for the puppies before they were conceived. 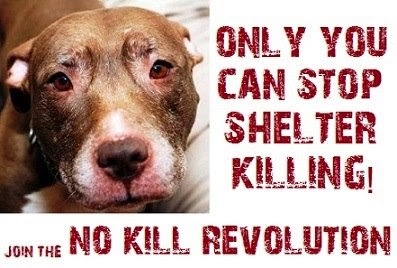 Many even breed the types of dogs that animal shelters are already overflowing with – the breeds that are put to death in their millions every year, simply due to lack of homes. 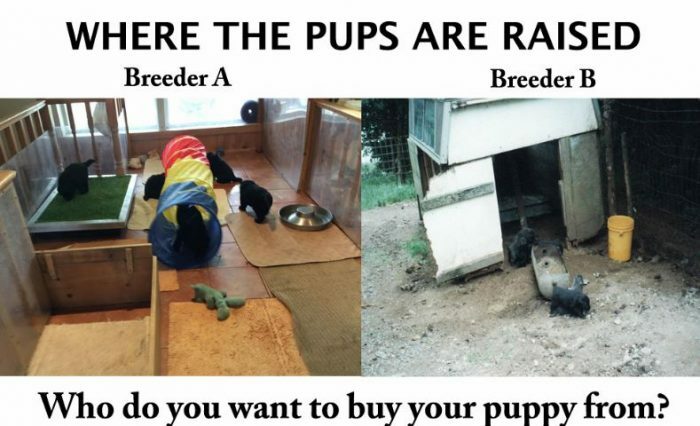 Sadly, many of these newly bred puppies later end up in shelters and meet the same fate. The suffering she caused included a dog being effectively blinded due to neglect and sadly having to be put to sleep after being rescued, and another who had been suffering from a painful abscess and had to have numerous teeth removed. Ms King, now of Station Road, Appledore, near Ashford, Kent, was convicted of causing unnecessary suffering but was only given a suspended sentence, community service and a £250 fine. Be careful of puppy farms posing as rescue shelters and advertising their dogs for “adoption”. Breeding operations across the world are using online pet adoption sites — meant for genuine animal charities to re-home pets saved from abusive or neglectful homes — to peddle dogs. Many simply pretend to be rescue organisations. Others have gone to the trouble of actually forming legal charities to sell animals raised in factory-like facilities. This has come about because, as people become more educated about puppy mills and the horrifying cruelty involved with them, they avoid them. Unscrupulous people have recognised that, if they present these puppy farm dogs as rescued dogs in need of adoption, they can sell them to unsuspecting “adopters”. When local authorities raided one such operation, they found about one hundred dogs sharing small cages. 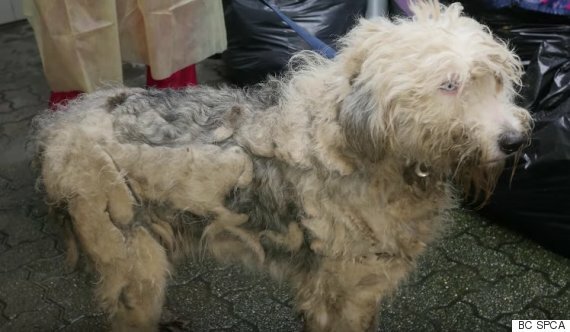 Underfed and thirsty, many of these neglected dogs were sick. Others were dead and some corpses shared cages with live dogs. It is not only puppy mills that put puppies to death if a condition, such as deformity or deafness, is detectable before they are sold. Breeders will often put the puppies to death if they are ‘sub-standard’. This is despite it not being the fault of the puppy, but of the irresponsible breeder for not doing the vital health checks on the breeding parents. The health checks would have revealed whether the parent dogs were suitable to breed from and check whether they would pass on defective genes and conditions. Irresponsible breeders main concern is making money. They do not want to cut in to their profits by doing health checks, etc. They could not care less about passing down defective genes. They do not care about the painful conditions their actions cause dogs to suffer throughout their lives, or about the heartbreak and expense the dogs’ suffering causes the owners they sell to (see Bad Breeders). They certainly do not care about increasing the number of innocent, healthy,abandoned pets that are put to death, because of them adding to the already huge dog overpopulation. When the puppies from irresponsibly bred litters are bred from again, (by other irresponsible people attempting to make money), the defective genes are again passed on and the cycle continues. Please do not fund this selfish greed and cruelty. Always adopt, never buy. It is common for unscrupulous breeders to provide false ‘official papers’ with puppies that they claim are kennel club registered pedigree dogs, so they can justify charging the money they do. There are plenty of instances where the puppies have grown up in to cross breed dogs bearing no resemblance to the breed that the pedigree papers claimed they were! 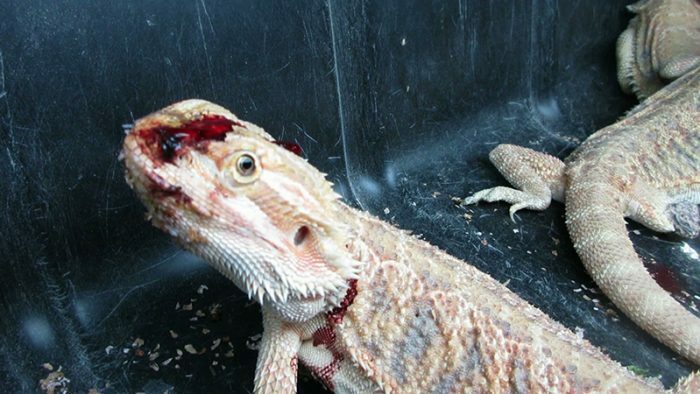 To learn the dangers of falling victim to a bad breeder, and to find out what you should expect from a good breeder, open up this page: Bad Breeders. Of course, with millions of loving, re-homable dogs being put to death every year due to the lack of people adopting them, it is unthinkable to encourage dog breeding by buying a puppy instead of saving the life of one of those innocent dogs. Did You Know? The healthiest dog to get is a crossbreed – the more of a mixture, the better! These dogs have the least health problems in life as they are least in-bred. 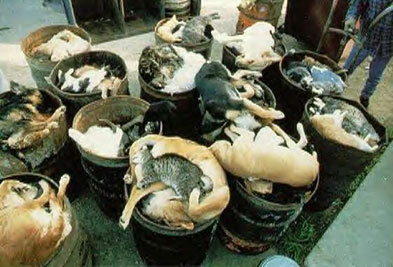 Image: Abandoned pets put to death and stuffed in to bins. If you are interested in helping one of the millions of abandoned dogs by adopting, fostering or sponsoring one, please have a look at the Adopting Rescue Pets page. If you would like to adopt a pet, or foster or sponsor an animal, this site gives you access to animals available at animal shelters and rescues all over the U.K. and US. Just see our Find A Pet page. If you learn of any puppy farms where the dogs are suffering and the owners are breaking the law, report them to authorities and your local animal charities, such as the RSPCA/SPCA. It is a big help to animals if you can share the information you find on this site on social media. There are so many people who do not realise the cruelty that goes on, and that they are inadvertently supporting it.